Assembling Ugears model Hurdy-Gurdy. Without glue, special tools and toothpicks. The history of this instrument begins in the 15th century. One of the earliest forms of the hurdy-gurdy was the organistrum (a portable organ) in Medieval Europe. After some modifications it became a common instrument among travelling musicians in England and went through its renaissance period in the later 17th-18th centuries as more of the noble class musical instrument for the amusement of the rich. Those instruments were decorated by craftsmen with inlays and carving and had the built-in hurdy-gurdy mechanism into the guitar or lute body. Some call the Hurdy-Gurdy music "a medieval rock’n’roll", which we find pretty cool. 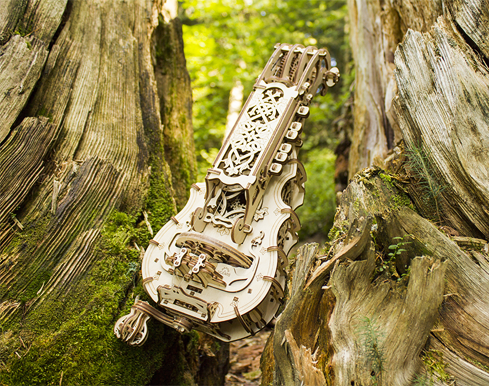 It captured us and we decided to create the Ugears' version of the Hurdy-Gurdy.